The subject is the popular ‘Searching for Prunus Blossom in the Snow’ (see Sale 1, lot 91, by Zhou Leyuan). Ding’s indication of a snowy landscape is less obvious than Zhou Leyuan’s. 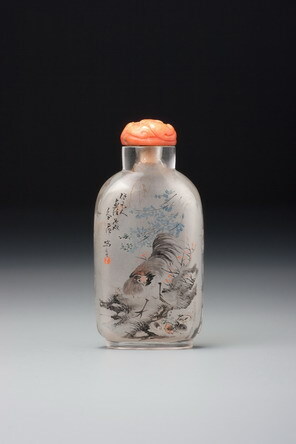 Ding first painted this subject in 1895 on the magnificent bottle from the Stephen Thal Collection now in the Seattle Art Museum (Chen 1998, p. 84, no. 38) but the differences between the Thal bottle, this one, and Treasury 4, no. 554, all demonstrate, yet again, that although Ding might paint the same subject over and over again, as did so many Chinese artists of the literati tradition, he never painted the same painting twice. On the other side, the number of chicks intended is uncertain. As a rule, the subject either has two or three, to represent chicks in general, or five, to give the more precise symbolism noted below. Here, however, the exact number is a trifle ambiguous, since the one beyond the bank has none of the body colouring of those in front of it and appears to be a random group of grassy markings that happen to look like a chick. Chicks in general represent ample progeny. Five chicks allude to the success story of Dou Yujun, better known as Dou Yanshan, a high official serving the court of the Later Zhou (951–960). Dou was noted in his hometown for charitable deeds and active promotion of scholarship. Under his guidance, his five sons, one after the other, attained the jinshi degree. Many people have found Dou’s conduct worthy of emulation. His achievement in shaping the careers of his sons has also been deemed exemplary. The five chicks, therefore, form an allegory with an encouraging note: ‘Through your efficient training at home, your offspring will surely achieve scholastic distinction’. This is one example of Ding’s debt to Zhou Leyuan. See Zhou’s cockerels on Sale 3, lot 22, and on no. 415 in Moss, Graham, and Tsang 1993.